South Korea's president said Tuesday no timeframe has been set for a historic visit to Seoul by North Korean leader Kim Jong Un despite both hoping it will take place this year. President Moon Jae-in said more important than the timing of the visit is that it would accelerate the denuclearization of the Korean Peninsula and give impetus to talks between Kim and U.S. President Donald Trump. "Ever since South and North Korea were divided into two countries, this will be the first time that a North Korean leader will visit South Korea," Moon said through an interpreter. "So although there is no timeframe set for that, still, it's very meaningful." Moon made the comments to reporters on the final day of a visit to New Zealand. 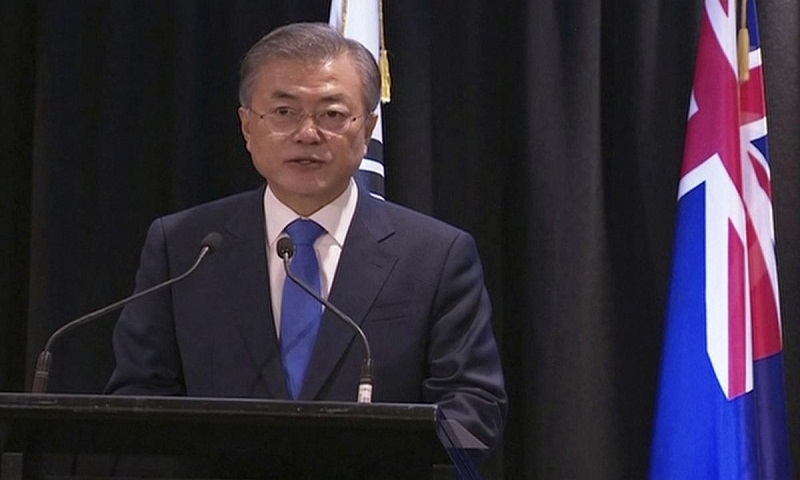 Moon and his wife, Kim Jung-sook, arrived in the South Pacific nation late Sunday after attending the Group of 20 Nations summit in Argentina. Moon said there still is a possibility Kim's visit could take place before the end of the year. Moon has met Kim three times this year. After their third meeting in North Korea's capital, Pyongyang, in September, Moon said Kim agreed to make a reciprocal visit to Seoul in 2018. Moon has also facilitated a series of high-level talks between the U.S. and North Korea, including a summit between Trump and Kim in June. Moon said he and Trump agreed that a visit by Kim to the South Korean capital would give a boost to plans for a second U.S.-North Korea summit, which Trump has said he hopes to hold with Kim in January or February. New Zealand Prime Minister Jacinda Ardern praised Moon's efforts after she met with him. "Mr. President, I want to commend you again for your personal leadership over the last year to reduce tensions and establish dialogue with North Korea," she said. Ardern said New Zealand and South Korea forged ties on the battlefields during the Korean War nearly 70 years ago. The two countries signed a free-trade deal in 2015. Ardern said New Zealand will soon allow smoother immigration procedures for visitors from South Korea and plans to improve pension portability between the two countries. She said that beginning next year, New Zealand would allow South Korean passport holders to enter through automated "eGate" immigration lanes.